↑ typically, youtube disabled/ removed 4k playback on this video but not on other youtuber’s 4k videos. +compressed consumer 4k 4x greater resolution than 1080p hd even on non 4k laptop display, but also 4 times more storage & expensive = better value than uncompressed pro 4k larger cameras’ 10 times more storage & expense. 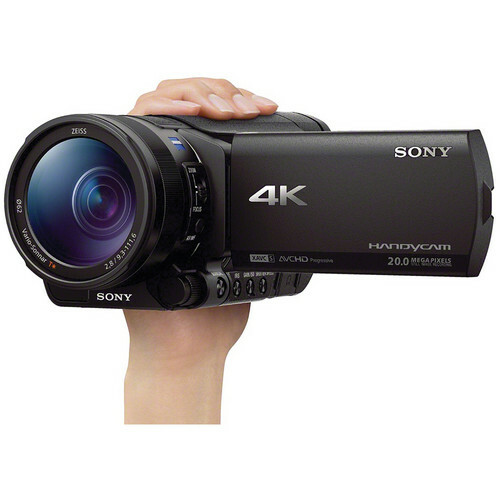 +/- the only pocket $2000 4k stereo camcorder besides panasonic gh4 if that fits depending on lens, sony alpha a7s does full frame 4k (eos 1dc doesnt) but records externally “to keep camera size small”. +uploads to youtube & played in 4k a little bit but then the 4k option disappeared from the “quality” drop up menu. -LOUD INTERMITTENT RATTLING MOTOR NOISE recroded in quiet rooms, FLANGING noise in loud ones. Rattles when the lens cap is off; could be autofocus. If you cover the built in mic with your hand it’s as loud as a motorcycle! -dual record photo video buffer too slow & stops re-recording when saving only 3 20mp or 14mp photos.. 20-30 second long delay to restart recording, missed shots..
-photo files don’t stay in chronological order; only minutes, not seconds, are recorded. view icons instead of list. mixing 2 camera files in 1 folder will be out of sync, & name order will separate them. -seems to drain battery while off?! like nx30 & xlr adapter did..
-FALSE “card full, no more movie recording portion of card is full” when it’s still 1/3 empty..
-corrupts cards: disables editing writing file title metadata, disables file deletion.. “cannot be deleted”..
-overexposes in sunny daylight, forcing manual ND1, 2, 3. switch to fix it. -sony vegas coz incompatible w/ fcpX according to b&h customer reviews? A second sony ax100 camera also rattles in quieter rooms, noticeable in headphones. The rattle is loudest when putting ear on it or covering the built in microphone. In a normal room the rattle was masked by an unacceptable loud flanging noise less audible on other cameras; when moving into the quieter connecting bathroom, the flange was replaced by the rattle ruined recordings. conclusion: both fdr ax100 cameras returned for worse audio than the sony nx30 fan hissing noise. The nx30 has xlr adapter phantom power for external mics with less crackling noise over audio level 5. Dilemma: 4k picture with rattle & hum or hidef with fan noise take the hiss..
no way to say nay to 4k! 4k’s ok! goin all the way, babay, yay!